One of Star Trek creator Gene Roddenberry’s favorite tropes was the “godlike being,” an alien life form with infinite powers who had to be either outsmarted or reasoned with by the Enterprise crew. 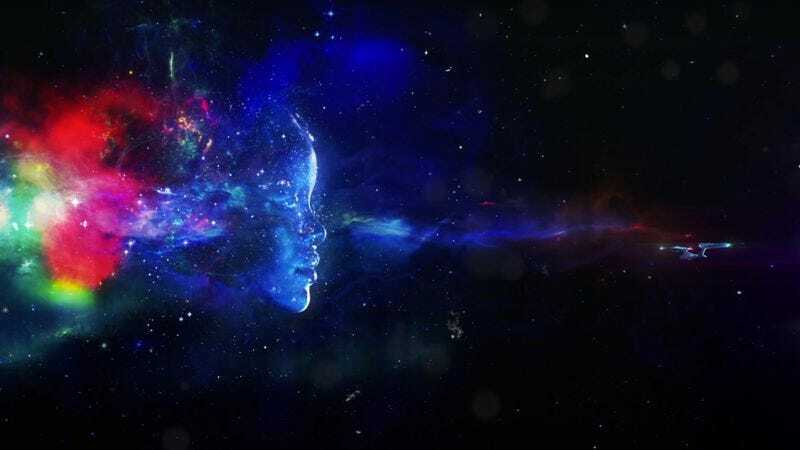 And Rihanna seems to be channeling that sort of all-powerful alien in the music video for “Sledgehammer,” her new single for Star Trek Beyond. She begins the video as a humanoid alien whose powers include standing dramatically on rocks. But as the video goes on, more and more of her abilities emerge, until she’s suddenly manipulating the elements and appearing as a giant space face overlooking the Enterprise. Directed by Floria Sigismondi, the music video is the first to be shot entirely on IMAX cameras, and even debuted in IMAX theaters. The song itself—which was first heard in the most recent Star Trek Beyond trailer—is haunting, ethereal, and not at all like Peter Gabriel’s single of the same title. “Sledgehammer” was co-written by Sia, but also has a very personal connection for Rihanna. It turns out she’s a lifelong Star Trek fan, as she discusses in a video about the song. Rocking a t-shirt from The Original Series, she explains that her dad introduced her to the series when she was a little girl and that her love of the franchise “never left” her. And now she’s left her own godlike mark on the franchise too. “Sledgehammer” is currently available on Spotify and can be downloaded just about everywhere. It can also be heard when Star Trek Beyond opens on July 22.